1. .sep project file can be open in TextEdit or other text apps. When anything weird happens, open the .sep project file in any textedit app, then copy all timecode and subtitles and paste them to a new .sep project. You won’t lose any of your work. 2. If Subtitle Edit Pro cannot open your SRT file, there might be some problems going with the SRT file itself. Please refer to the SRT part of this post: PremiereSRT Question and Answer. hi, normaly the text in the lower ist perfect, some time I need the text on another position. is this possible? What app do you mention? 1) Where can I find an explanation and tutorial on the Subtitle Edit Pro interface? 2) What do the different coloured frames in the video window mean? The frame made of red dashes, then the green and yellow frames? 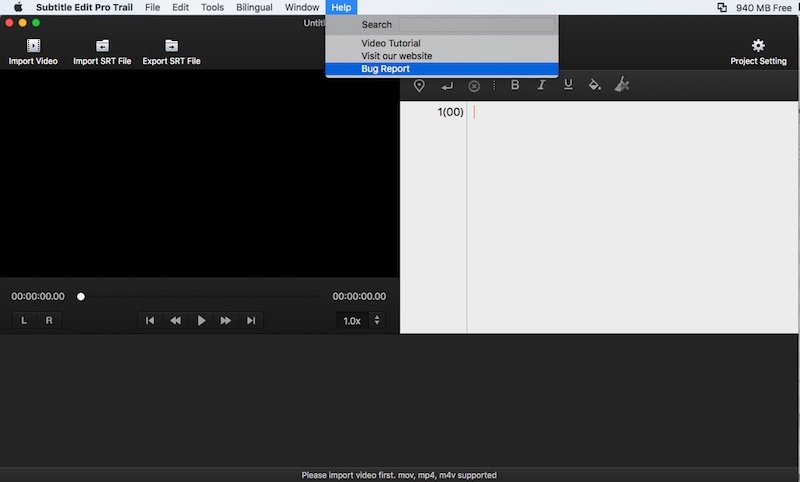 4) If I would want to control the appearance of the texts the end user will see, could I use something like your Subtitle Burner to take a file from Subtitle Edit Pro, and my video file, and then burn a video having exactly the visual kind of subtitles I want the end user to see? 5) What do the different coloured frames in Subtitle Burner mean? 6) I do create (scriptwrite and shoot) a lot of short and some longer videos, they will be mainly for Youtube. No commercial stuff, no subtitling movies. DO you recommend soft or burned subtitles? Thank you for a good software. I hope you’ll be able to give me advise and answers as soon as possible. http://www.finalsub.com/sep.html is the website for all information of Subtitle Edit Pro. Kindly DO NOT PUT MY NAME on your Q&A page. I have no wish whatsoever to appear there with my name. IF you cannot publish anonymous posts, then just do forget my post and delete it, please – or simply use “M” instead of my name. Can subtitle pro export tiff’s out of the software? Is there a trial version we can download to see of the program for fulfill our needs? No tiff or png output and no trial version yet. I wonder if you can customize the positioning of the subtitle? Occasionally I have the need to make a textline appear somewhere else on the screen, than below, in the middle. For example when a burned-in text appears in that place. Is this possible? I also would like to know if it is possible to chose the font and character effects, like contour, shadow etc.? New version of Subtitle Edit Pro support positioning of subtitle. 2. export the file not only as SRT file, but also as DVD Studio Pro STL file, so that information about text positioning will be preserved. Since Subtitle Edit Pro is just for SRT creating or editing, we don’t support font settings. You can adjust the positions or something else in it, but when you export a srt file, all formats just goes away since SRT itself doesn’t support formatting. So vertical text alignment won’t be supported in the near future. Once you get the SRT file, you can easily convert it to actually any format you need by some free app. SRT converter is one of my other paid app on Mac App Store doing that. Sorry for the inconvenience caused. When I export the srt file, i can´t see most of the symbols used in spanish language (ñ,ç,ò,ó…and so on), I guess your app works great for english but it won’t do the job for other languages. Is there any way to change it? The Command+L are reserved for other purpose. Maybe this is what the problem like. Really love your app. The only thing I’m missing is converting between differnt framerates (particularly 23.976 and 25) and I’m wondering if this is possible for the future? Subtitle Edit Pro 4.0 new version on Mac App Store has this framerate convertion. Please go download. Thanks. First and foremost: I love your app! This is the first one that I find natural to use. Sometimes unsync subtitles results from different cuts and thus you only need to shift times for a specific range. This would be truly great! I would like to know whether it is possible to obtain an evaulation/trial copy before I decide to purchase your application.